The Pay-What-You-Want (PWYW) pricing model has been popping up all over the map in many sectors of business. You can PWYW at a Yoga class in Hong Kong, museums in New York, restaurants in Europe, digital downloads and marketing services online – just to name a few. 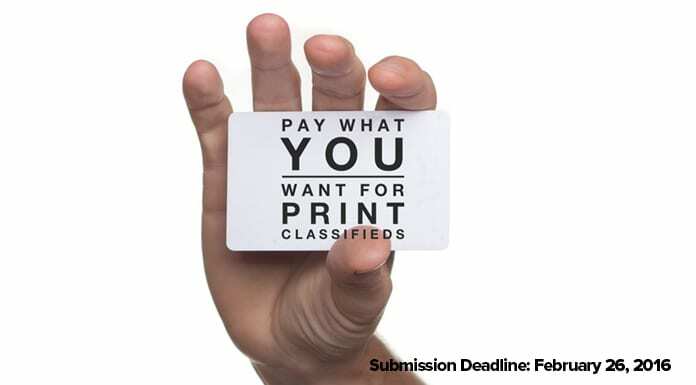 In our March/April issue, Jumpstart Magazine is offering PAY-WHAT-YOU-WANT for text classified ads in our print magazine. You can promote your business, a startup event, look for a business partner, announce a discount or use it as you wish. We are excited to test out PWYW model with you! Jumpstart will feature classifieds in the March/April 2016 issue of Jumpstart. Your classified will appear in our print magazine reaching 15,000 readers at 350+ locations. We will post your classified online as well. The March/April issue will be out mid-March. You are invited to submit up to 20 words + URL or email address. Please submit your text to info@jumpstartmag.com by February 26, 2016 and pay what you want via the button below (paypal or credit card). All we ask that it’s one ad per company and that it’s used by HK Startups only. We reserve the right to turn down or edit an ad (we’ll let you know right away if that happens).